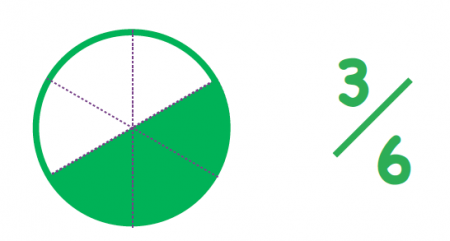 We explain what the denominator of a fraction is and give examples of how the concept is taught in primary-school maths, as well as explaining fractions equivalence and the relationship between the numerator and denominator. The denominator is the bottom number of a fraction. So in the fraction 3/8 the denominator is 8. In the fraction 5/6 the denominator is 6. In Y2 children are taught to find one half, one quarter and three quarters of shapes. In Year 3 they start to write fractions correctly, using fraction notation (looking at the diagram below, writing '3/6' to express what they are seeing). At this point they will be introduced to the concept of numerator and denominator. It is helpful for them to see diagrams so that they are aware that the denominator is the total number of parts. In Years 3 and 4, children learn about fractions equivalence. 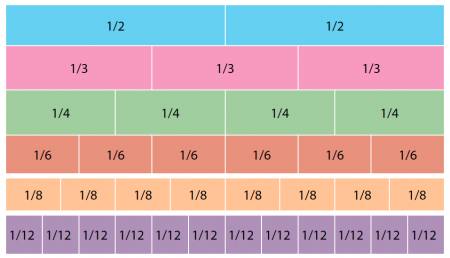 Looking at a fractions wall they will start to understand how fractions can represent the same amount, even if they are split up into different numbers of parts, which give them different denominators. In Years 4, 5 and 6 they need to relate fractions to their decimal equivalents. 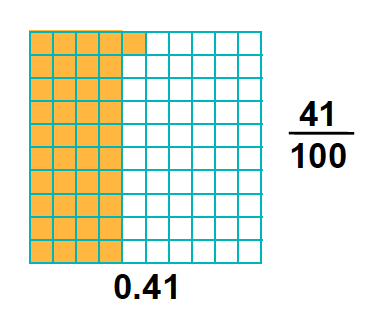 To understand this, it is helpful for them to understand that decimals deal with whole numbers being split into one hundred equal parts, so a decimal number can be compared to a fraction with 100 as the denominator, for example: 0.41 is 41/100. In KS2 children learn to simplify fractions by dividing the numerator and denominator by the same number. They may also be given a list of fractions with different denominators and be required to convert them all so that they all have the same denominator.